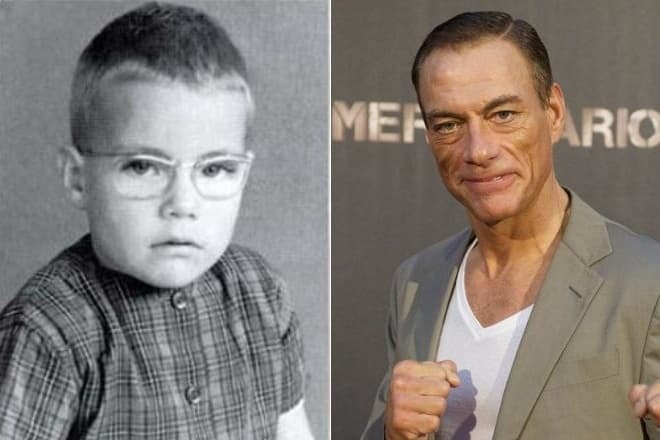 Jean-Claude Van Damme is a Belgian bodybuilder, actor, and stuntman. Van Damme’s filmography has about fifty roles. The Belgian actor became famous for numerous martial arts action films. Besides, Jean-Claude has mastered five martial arts disciplines, and also worked as a screenwriter, director, producer, editor and fight director of more than a dozen films. At birth, the name of the future actor was even longer. He was born Jean-Claude Camille François Van Varenberg on October 18, 1960, in Berchem-Sainte-Agathe, one of the nineteen municipalities of the Brussels-Capital Region, in the family of an accountant and housewife. The boy's father also owned a flower shop. The mother brought up the only son. In early childhood, the mother probably paid much more attention to the child than the father, because little Jean-Claude was a pampered, feeble and whining boy, although now it’s difficult to believe it. Nevertheless, a tall for his age and slender kid wore glasses with thick lenses, was round-shouldered and frail, although he took up ballet. When the boy was ten years old, his father enrolled Jean-Claude in the karate school to instill a love for the sport and show a fair competition. Jean-Claude immediately liked the martial arts. 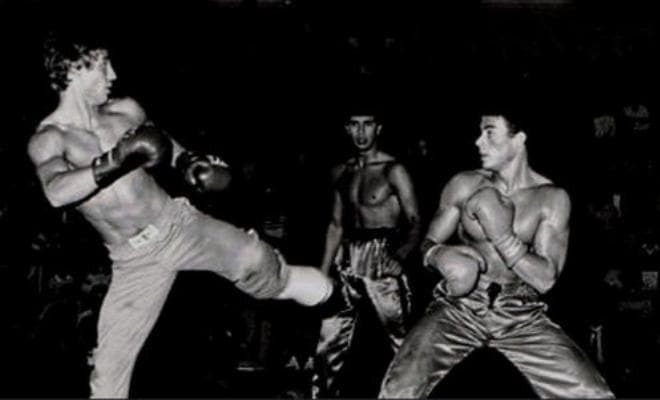 Under the guidance of coach Claude Goetz, the guy mastered not only the technical skills of karate but also psychological training, auto-training and hand-to-hand combat. His diligence bore fruit. Jean-Claude could do the splits, straightened his back, gained weight. The weight of the young man was 85 kg with a height of 177 cm. After eight years of training, the future star of sports and movies earned his black belt, and two years later won the European Karate Championship, knocking out an opponent in the first round. The complete statistics of Jean-Claude Van Damme's professional fights is as follows: 22 fights, 20 victories (13 knockouts), as well as two defeats. 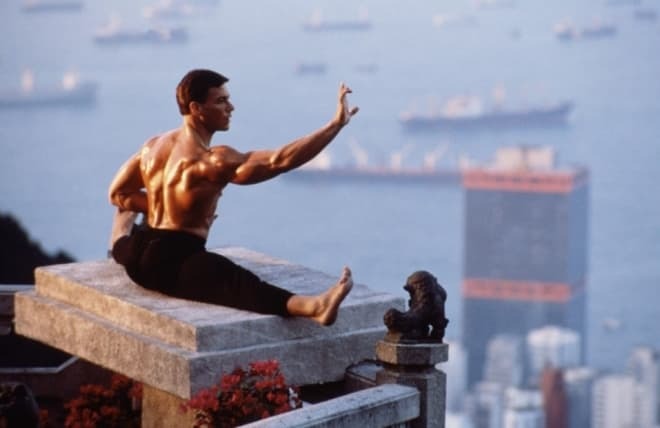 It is interesting that Van Damme has mastered not only karate, but also four other martial arts disciplines: American kickboxing, Thai boxing (also called Muay Thai), Chinese martial art (Kung Fu), and Korean martial art (Taekwondo). Although, at the age of 19, Jean-Claude opened his own fitness center called California, where he taught karate, aerobics, and bodybuilding, the world of cinema attracted Van Damme very much. Therefore, having forgotten about a promising business, which brought the bodybuilder a good income, the young man took the risk. Jean-Claude sold a gym, went to a film festival using a fake invitation card, and got important contacts in the world of cinema. Then he went to conquer the United States of America. At first, the odds were against the future actor. The preliminary agreements with actress Jacqueline Bisset turned out to be leaves without figs, and Van Damme had to fight way in the world of cinema. For four years, the young man called numerous studios unsuccessfully, offering himself as a candidate to participate in films. At the same time, Van Damme worked as a chauffeur, a fighter of underground clubs and even a bouncer at the club owned by Chuck Norris. He made his film debut in 1986 in the film No Retreat, No Surrender, where the actor played the Russian fighter, Ivan Krushensky. For the first time, he used the stage name, Van Damme, which later became famous. Jean-Claude had to change the real name of Van Varenberg because it was difficult for English-speaking people to pronounce it. But the actor became famous after the release of the popular film Bloodsport, which grosses 30 times exceeded the budget. The following films such as Kickboxer, Lionheart, Double Impact, Universal Soldier, Nowhere to Run, made the actor even more famous. 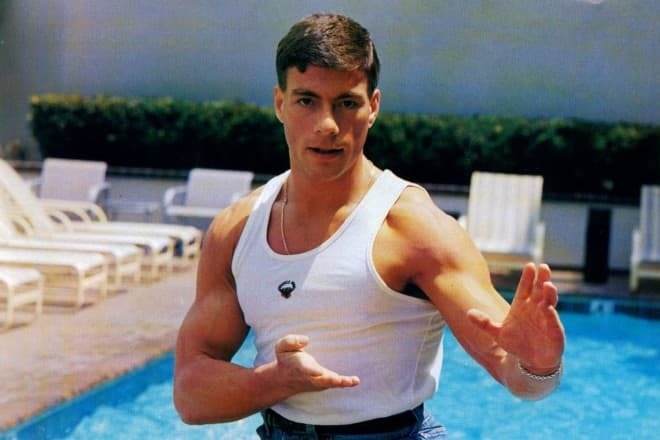 Van Damme became so popular that he inspired the title character of the computer game Mortal Kombat, and boys all over the world enrolled in the karate clubs. However, the episode of the film Kickboxer, where Jean-Claude dances, has become the most memorable action movie moment. It is interesting that since the actor cannot get rid of the French accent completely, Van Damme’s heroes often have French names and ancestry, for example, Luc Deveraux, Christopher Dubois, Chance Boudreaux, Lyon Gaultier, Alain Lefevre, Phillip Sauvage, Jean Vilain. 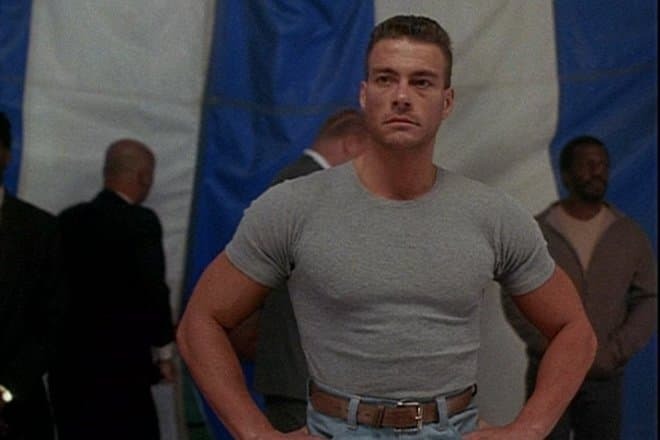 In 1992, 1993 and 1994, Van Damme was nominated for the MTV Movie Awards – Most Desirable Male. In the mid and late 1990s, Jean-Claude Van Damme was not an in-demand actor because martial arts action films lost popularity. Such films as Legionnaire, Double Team and Wake of Death were not successful, despite the good screen stories and the actor’s excellent acting. Van Damme made a breakthrough again after the release of the film JCVD in 2008. Riding wave of new popularity, the actor appeared in a series of sequels: Universal Soldier: Regeneration, Universal Soldier: Day of Reckoning, The Expendables 2 and other films. In 2012, Jean-Claude Van Damme appeared in the Russian film Rzhevsky versus Napoleon. In the Russian comedy, the Belgian got a bit, almost cameo part. Van Damme played a foreign guest. Then the actor returned to the usual action film genre and played the leading roles in the movies Six Bullets, Enemies Closer and Pound of Flesh. 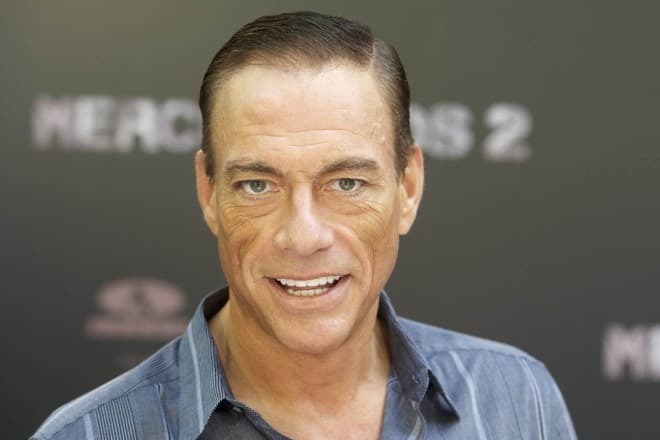 In 2014, Van Damme appeared in the action comedy Welcome to the Jungle. Like many public people, Jean-Claude Van Damme had scandalous relations that evoked high emotions. The actor has been married five times to four different women. For the first time, Jean-Claude married at the age of eighteen. 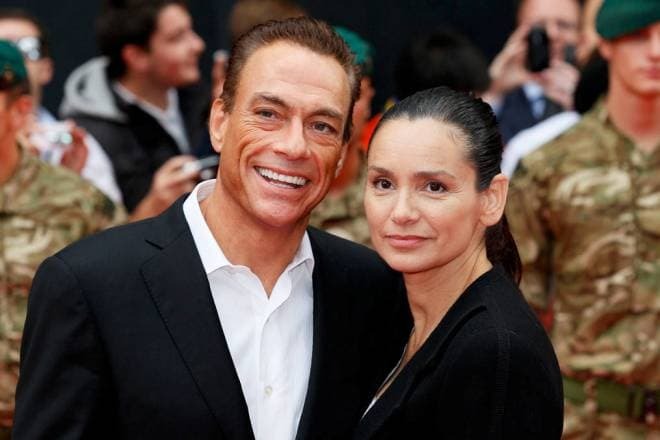 Van Damme’s wife was a wealthy girl, Maria Rodriguez, who was seven years older than her husband. The couple divorced when the future actor went to conquer America. However, Jean-Claude was not alone for a long time, and he soon married Cynthia Derderian, the daughter of a construction company owner where Van Damme worked as a chauffeur. The second marriage lasted only a few months and broke up due to the actor’s popularity. At Chuck Norris’s party, Van Damme met the bodybuilder and Champion, Gladys Portugues. 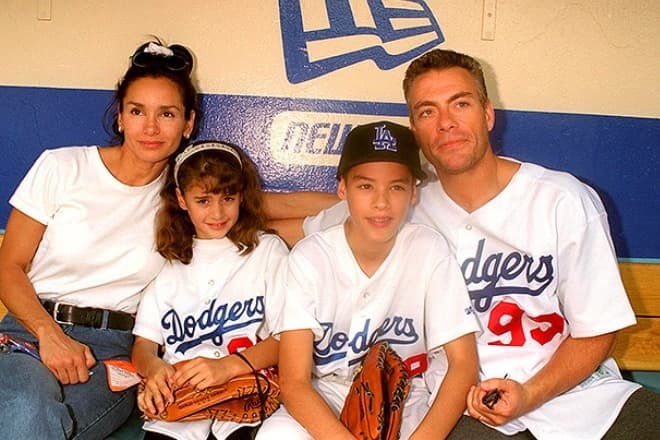 The sportswoman became the actor’s third wife, the mother of their son Kristopher and daughter Bianca, and, in the future, she would become the most important woman in the star’s life. But at that time, the marriage lasted for several years. Gladys left her husband because of Jean-Claude’s love affair with beauty queen Darcy LaPier. It is interesting that the former wife did not require any financial obligations, which is very unusual for Hollywood families. Then the actor married LaPier, who gave birth to Van Damme’s son Nicholas. This time they divorced because of the actor’s career problems that caused revelries, alcohol, and drugs. For the fifth and last time, Jean-Claude married the mother of his children, Gladys Portugues, who supported her ex-husband in a difficult situation. The couple married in the actor’s homeland, in the church near Brussels. Later, Van Damme has repeatedly stated that Gladys is the only beloved woman. In January 2016, the cartoon about martial arts Kung Fu Panda 3 was released, and Van Damme voiced Master Croc. On September 2, 2016, the film Kickboxer: Vengeance, the reboot of the 1989 action movie of the same name, premiered. 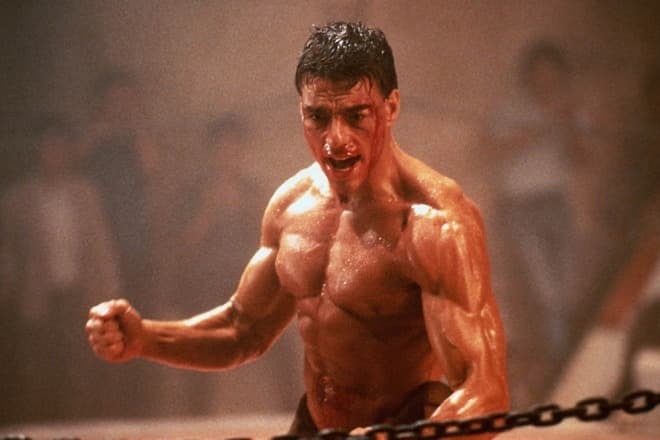 In the original film, Van Damme played the role of a young fighter, Kurt Sloane, and in the remake, Alain Moussi got this role. Jean-Claude Van Damme played the role of Sloane’s mentor, master Durand. In 2017, the sequel Kickboxer: Retaliation is scheduled to premiere. Boxer Mike Tyson plans to join the cast of the film. In 2017, the films with the participation of Van Damme Black Water, Kill 'Em All and Antwerp Heist will also be released. The action-drama Full Love still has distribution problems. Jean-Claude played the leading role in the film. The actor was also a director, producer, screenwriter, and editor. The finished video was screened at the 2010 Cannes Film Festival and the 2014 Shanghai International Film Festival. The future of the movie has yet to be decided.